Dudhwa National Park or the Dudhwa Tiger Reserve residing the areas of Lakhimpur & Kheri district of Uttar Pradesh, lying adjacent to the Indo-Nepal border bringing together two most incredible sanctuaries of the area namely, Kishanpur and Katerniaghat Wildlife Sanctuaries to represent the excellent natural forests and greenery along the Terai region. Quite impressively, the northern boundary of the park is being constituted by the Mohana River flowing along the Indo-Nepal border whilst the Southern boundary is formed by the river Suheli. The Kishanpur Sanctuary lies in the Lakhimpur- Kheri and Shahajahanpur districts in Uttar Pradesh. Spreading across an expanse of 811 sq km beholding the nature lovers with marshes, grasslands and dense forests, the area is actually meant for tremendous counts of Swamp Deer and Tigers species. The area of the Park is composed of a vast alluvial plain along the tributaries of Mohana and Suheli, interspersed with numerous rivulets, lakes and pools. The rich and extremely fertile Indo-Gangetic plains support a flamboyant growth of forests diversity of fauna. The park has some of the best forests of 'Sal' tree in the world, amongst other flora; and is a virtual unexplored paradise for nature lovers, wildlife enthusiasts and bird watchers. Dudhwa attracts the visitors with its two core area as Dudhwa National Park and Kishanpur Wildlife Sanctuary which are separated by each other with an area of 15 kms agricultural land. Unlike other celebrity parks of India like Corbett, Kaziranga, Bandhavgarh etc, the uncommercialized ambience of this park makes it an ideal habitat for the wild creatures to find nature's serenity & comfortability in a more natural way. The Post-Independence era witnessed tremendous encroachment towards the Dudhwa jungle. As a result the forest was converted in an agricultural land. 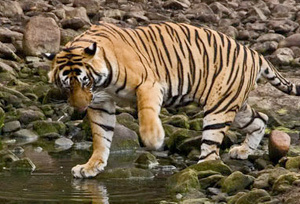 Additionally, due to its location on the Indo-Nepal border the chances of poaching and hunting enhanced to greater extent and the trading of the wild animals increased to a massive extent who sell their products in Nepal, which being a tourist place gives them a huge market for these things. It was the perfect money-making place for the poachers but it was "Billy" Arjan Singh whose single handed efforts made this park to reach at its richness. The great conservationist initiated an idea of converting this land into a wildlife sanctuary in the year 1965 and thus received a lot of appraisal from the wildlife conservationists and wildlife lovers across the world. In 1977, Arjan Singh approached the erstwhile prime minister, Indira Gandhi to declare the forest as a National park. In 1984-85, seven rhinos were relocated from Assam and Nepal to Dudhwa to rehabilitate a rhino population which lived here 150 years ago. Four years later, it was declared a Tiger Reserve under the Project Tiger and currently is a major habitat for tigers in India. Dudhwa being spread over an expanse of approximately 811 sq km of marshes, grasslands and dense forests, is an ideal and protected home for over 38 species of mammals, 16 species of reptiles and numerous species of birds. Tiger, Rhinoceros, Swamp deer, Elephant, Sambar, Hog deer, Cheetal, Kakar, Wild pig, Rhesus monkey, Langur, Sloth bear, Blue bull, Porcupine, Otter, Turtles, Python, Monitor lizard, Mugger, Gharial etc. Of the nearly 1300 birds found in the Indian subcontinent, over 450 species can be seen in Dudhwa Reserve. These include Hornbill, Red Jungle Fowl, Pea fowl, Bengal Florican, Fishing eagle, Bengal Florican, Serpent eagle, Osprey, Paradise flycatcher, Woodpeckers, Shama, Indian Pitta, Orioles, Emerald dove etc. During winter the vastand varied water bodies attract a large variety and number of migratory birds making the reserve a favorite haunt of bird watchers. 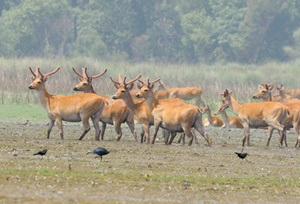 Dudhwa Reserve represents some of the best natural forests and grasslands left in the Terai district of Uttar Pradesh. The vegetation is of the North Indian Moist Deciduous type, containing some of the finest examples of Sal forests (Shorea robusta) in India, as well the most extensive tracts of moist grasslands that remain in this region. Frog Temple : From Dudhwa national Park, the tourists can make a fine excursion towards the unique Frog Temple at Oel town which is 12 kms from Lakhimpur on the route from Lakhimpur to Sitapur. This is one of its kind of temple based on the Maduk Tantra and was built by the former king of Oel state during 1860-1870. The temple is actually dedicated to Lord Shiva and is believed to be built on the back of a large frog. The Temple is constructed within an octagonal lotus. The Shivling installed in the temple was brought from the Banasur Prati Narmdeshwar Narmada Kund. The architecture of this temple is based on Tantra Vidya with its main gate opening in the east and another gate in the south as an exit. Surat Bhawan Palace : Built in 1894, the Surat Bhawan Palace near Dudhwa National Park is made in Indo-Sarasenic style and is composed of ten bedrooms, one large dining room with pantry and two lounges. The palace set in a large green, nine acre retreat is eight kms away from the park with its eastern entrance facing the reserve. Lucknow - the city of the nawabs is the most visited place for the tourists coming to Dudhwa Reserve where the tourists can find multiple attractions in the name of Bara Imambara, Chattar Manzil, Jama Masjid, Rumi Darwaza, Moti Mahal and much more. The main hub of multiple facets of industries Lucknow is best known for the ancient historical importance. Safari in Dudhwa is the best option for the wildlife lovers to catch the amazing species of the dense ambience. Jeep safari in Dudhwa could prove as the perfect option for a wildlife safari. But for the sake of information and convenience, it is to remind that the forest officials do not provide any jeep safari or guides for assistance. One has to arrange privately for safari conveyance. Elephant rides through the Park are also offered and the mahouts or Elephant drivers also act as guides. Safari Timing : - Daily jeep safaris in Open 4WD safari vehicles, 7:00 AM to 10:00 AM and 3:00 PM to 6:00 PM. Park Opening Time : (Nov till May) the best time to visit the Dudhwa Tiger Reserve is from February to April. You can also visit during mid November to mid June. By Air : Lucknow is the nearest airport at a distance of 238 km. By Rail : Dudhwa Railway station at a distance of 4 kms is the nearest railhead. It is well- connected to Lucknow and Nainital via Mailani (37 km.) on the metre gauge. Another option is to undertake a 301 km. journey from Delhi to Shahjahanpur by rail, and then proceed by road to Dudhwa, which is another 107 km. By Road : The nearest town is Palia at a distance of 5 kilometers which is linked to Lucknow directly from the distance of 238 km. UPSRTC and private buses ply between Palia and Lakhimpur-Kheri, Shahjahanpur, Bareilly (260 km.) and Delhi (430 km). Dudhwa Reserve which is quite closer to the city of the Nawabs- Lucknow provides the ample amount of reasons for staying at this region. The other major attractions also allure the tourists to spread their magnanimous moods during their stay at this region. And the provision of different hotels & resorts make the journey more wonderful at its excellent level. Not so far away from the city's crowd, the accommodation options are accosted with beneficiary services and luxury amenities. Find the best one that suits your needs and enhances your pleasure during your stay in the Dudhwa Reserve area.